The second novel in one of the **MOST TALKED-ABOUT** post-apocalyptic series. The girl has no one to defend her now . . . The hunt for the girl, Lacey, is on. One man is tormented by an inner voice that isn't his. It eats away at his sanity and, with cruel precision, orders the lawless to follow him. Their mission is to find the girl, steal what she knows ... and kill. In an Inn by the sea, Albus gathers a family of warriors and waits to be called upon. He doesn't know yet why Lacey is important, but he trusts his sister. And Ruby says he must find the girl - before it's too late. 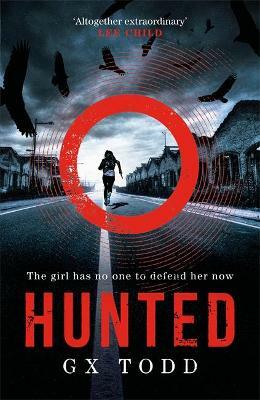 Hunted is the second book in the must-read Voices series, where a voice in your head might be all that stands between survival and death. G X Todd lives and works in the West Midlands. After completing a history degree at the University of Birmingham, she worked for public libraries for fifteen years, where she drove a 35-foot-long library van around the Black Country. She now spends her days living the dream: writing books while in her PJs. Todd has taken the world and characters we became familiar with in book one and expanded in the best possible ways – new characters, new concepts, new relationships, new dangers. I could easily have swallowed this book whole, but I needed to savour it – every last word! As ever, Todd strikes the perfect balance between action and character-building, allowing us to get to know those characters that she inevitably puts through the mill. I swear she took my heart and stomped on it at one point. What’s so delicious about this book is that, although we start to gain some information, some more understanding of this dystopian world, by the end we are hungrier than ever for more answers.